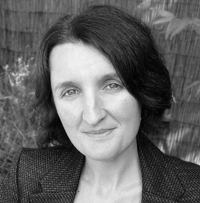 Rachel Elliott is a writer and psychotherapist. She has worked in arts and technology journalism and her writing has featured in a variety of publications, from digital arts magazines to the French Literary Review. She has also been shortlisted for a number of short story and novel competitions in the UK and the US. Rachel was born in Suffolk, and now lives in Bath. Her debut novel, now available in paperback, is Whispers through a Megaphone. Cowed by her domineering mother, even after her death, Miriam hasn't left her house in three years. When she finally steps outside, she meets Ralph, who's holed up in the woods after discovering his wife never loved him. Together, they are to discover that a little quiet contemplation clears the mind wonderfully. Darkly funny and jofully witty, it's a resonant novel about finding an oasis of silence in the inescapable din of the modern world. In our exclusive interview, Rachel talks about why life veers between comedy and tragedy, how her psychotherapy training helped in creating her characters and the strange situation of being able to write reviews of so many of our everyday experiences online. How did you come up with the idea of building a novel around a character as quiet and withdrawn as Miriam Delaney? Miriam is so real to me, even now, after the writing of her story has finished. It was a curious experience really, because she appeared vividly in my mind, every detail at once, from the way she walked around the house to the decor and feel of her home. She’s still so vivid that it feels like she must live in a suburb somewhere. Her quietness, and sense of being on the edge of things, are both exaggerated forms of my own, but perhaps like me, she’s not as quiet as she thinks she is. 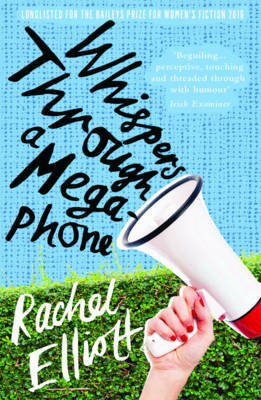 Whispers through a Megaphone moves between poignant, profound emotion and moments of wry, even absurd humour. Did you find this a difficult balance to strike? It’s really interesting that you say this, because it’s not something I’m consciously aware of, perhaps because this movement reflects how my mind works, and we aren’t always aware of these mechanisms. When I write something serious, humour is always there, on the outskirts, and it doesn’t take long for it to move into the foreground – and vice versa. What I would find difficult, I think, is writing one without the other. I have to deliberately contain my silliness – I could happily go wild with absurd tangents, because that feels deeply realistic to me. Life is dark, funny, profoundly emotional and bizarre. Some feel that British literary fiction has a tendency toward being backward-looking, preferring to shed light on past era rather than the present day. Do you feel that your novel offers something new by exploring the evolution of social interactions in 21st century? It’s fascinating to me that the notion of including modern social interactions could be seen as new. We seem to be at a curious point in time for the contemporary novel, because so much of our social interaction is digital, and yet if this is reflected in fiction, the common response is that it has been used by the writer as a theme or a subject. Online communication is ubiquitous and yet it isn’t as commonplace or ordinary as having characters chatting on the phone or in a cafe. What does this say about the novel as a form and what we expect of it? We used to see the inclusion of emails and texts as very modern, sometimes as a device, a way of commenting on social interactions, but for me, featuring tweets is no different to having a conversation between characters on the street. It’s just another social domain, and it’s revealing to see how people communicate differently, depending on where they are and what medium they’re using. Reading a character’s tweets and texts, placed alongside their face-to-face dialogue, says a lot about them. Our days are a series of interruptions, a collection of rapid changes, and yet we expect fiction to flow without those interruptions. It’s curious. You also work as a psychotherapist. Did you find this beneficial in creating authentic characters? Working as a psychotherapist is often about exploring our ambiguity, our patterns, our inner conflicts. This kind of thinking has always been my natural territory – I love paradoxes. As a writer, I’m less interested in ‘capturing’ a character as I am in presenting the multiplicity of a person, the contradictions and movement. We’re also back to the emotion and humour again, because in psychotherapy you can be talking about the saddest subject and laughing together seconds later. Humour evokes our shared humanity, an expression of the fact that life is ridiculously hard sometimes and we can find ourselves doing the strangest things to get by. You’ve written on the arts, among other topics, for a wide range of publications. How do you feel about being on the other side of things, with your work now subject to scrutiny? Well, this whole novel is about someone taking the risk of going out into the world and being seen. I’m very good at being invisible, but as Helen Macdonald wrote in the wonderful H is For Hawk, ‘it doesn’t serve you well in life’. It’s wonderful to have your work being read, and scrutiny is just one aspect of this. It’s an inevitable part of so many people’s jobs, especially now, when everything has become so public – I was in town last week, buying a sponge to wash my car, and the guy who served me explained that I could go online and review him, which made me sad. Are there books or authors that you feel inspired you as writer? There have been many over the years, but I can remember a few key encounters with books that changed the way I saw writing, so I’ll list a handful of these. Mrs Dalloway by Virginia Woolf. If Nobody Speaks of Remarkable Things by Jon McGregor. Music For Torching by AM Homes. Revolutionary Road by Richard Yates. The Accidental by Ali Smith. Everything Lorrie Moore has ever written. Sometimes a book’s atmosphere is what inspires me, like the mood of The True Deceiver by Tove Jansson, which stayed with me for ages. Can you tell us anything about what you’ll be writing next? I’ve started a new novel, and because I’m in the early stages, things are mainly cinematic. It’s a bit like when you wake up in the morning and you remember the fractured images of a dream, but you can’t place them, you don’t know where they belong. Thinking harder doesn’t reveal the full story – something else needs to happen.